Firewood ratings can be determined by a variety of different characteristics. When deciding what type of firewood to burn this year, there are a few factors you should consider in addition to heating value. When we think about firewood, most people want to know how many BTU's a specific species of wood will produce. Ease of Splitting - Straight grained wood with a limited number of knots will split pretty easy. Some woods, especially hardwoods with interlocking grain will be difficult to split. Ease of Starting - When building a new fire, choose a wood that is easy to start. Generally, softwoods create good kindling and fire starters because they are lightweight woods that contain natural resins that burn easily. Amount of Smoke - If you have neighbors close by, the amount of smoke a wood produces could be a concern. Sparks - A lot of softwoods have pockets of sap and moisture that will heat up and pop causing a spark to fly. These sparks can be troublesome and dangerous. Coaling Qualities - A hot bed of existing coals will make restarting a fire a lot easier. Hardwoods generally have the best coaling qualities. 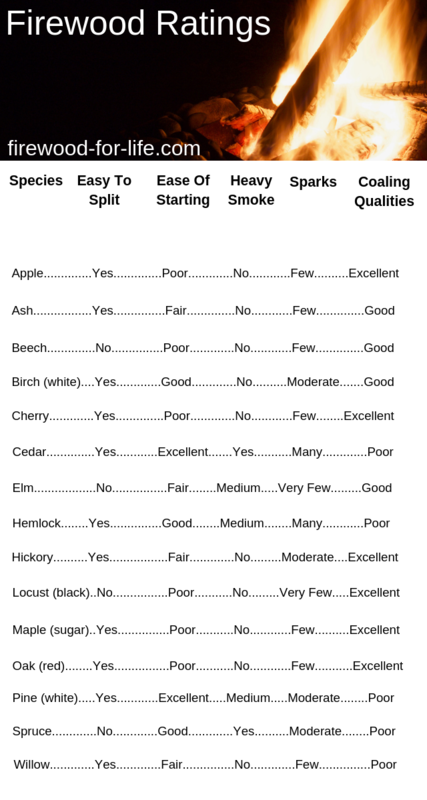 This chart shows the different firewood ratings for a variety of popular firewood choices. Choose a firewood that has acceptable characteristics for your specific needs. Overall firewood ratings depend on a lot of different factors. Since everyone has different needs and expectations, choose a specific firewood species that works best for you and your situation. Don't forget, you don't have to pick one individual firewood type. Mixing several different types of firewood together is often the best way!